3. Every time I go out for a run, I wind up in some dead-end alley amongst free-roaming dogs and boys playing soccer. 2. If you dine out and order a main course of beef, the waiter brings you a giant plate of it … followed by another giant plate of it. Getting soap out of this dispenser was not easy. I tried everything: pushing it toward the wall, pulling it away from the wall, moving it left and right, moving it up and down, pressing on the white base…. After about a minute of this, I realized that my hands were getting kind of slippery. 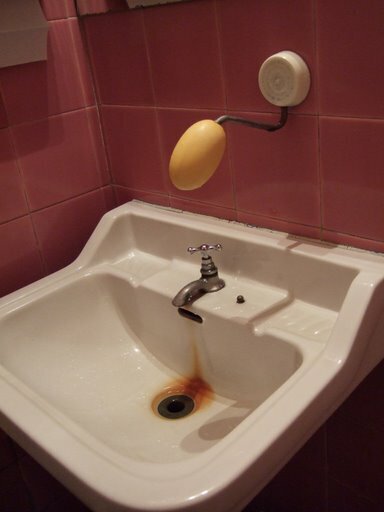 The yellow “soap dispenser” was made of soap. i appreciated the soap anecdote; i've made similar (delayed) discoveries of unfamiliar objects in foreign locales myself. i once came across a shower i never did figure out.please do let us know what happens when you run out of soap. but be careful. it's entirely possible that that metal rod "tapers" into a rusty razor blade! yikes! Imagine the opposite: an Argentine in a U.S. bathroom touching the soap dispenser everywhere to figure out where is the part that is made out of soap, and you get me! I hope you had fun in BA.